I recently took a look at SEMRush and I spent some time bending the ear of one of their specialists about it. They have kindly offered our readers the chance of taking up a 1 month Pro account trial – details at the end of this article. 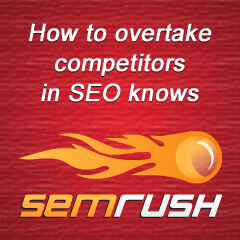 So, what do SEMRush do? SEMRush provides a wide range of data on any given website which is designed to help you to monetize and promote your site better. It uses Google.com traffic data to provide a detailed report of your website and provide information on your competitors and also possible partners. To help monetize a website it provides a CPC rating (cost per click) for your search engine traffic. For example. you may be receiving a lot of visitors to a particular page on your website, SEMrush provides a guide of how much it would cost you to get that traffic through CPC advertising, such as with Adwords. This gives you a good indication of how much you could possibly charge advertisers to have sponsored spots on your page. One way to use this information is to sort your web pages by the Costs% column (the ratio of the estimated cost of buying the same number of visitors for this search query) and then use this data to focus on those pages which are in highest demand. You can use this information to help sell your advertising space, as you can see how much it would be worth to an advertiser to get that traffic. Unfortunately there is no easy way to sort by CPC, if there was this would provide a good way to find the most expensive keywords being used to deliver traffic and this could be a really good selling point when talking to advertising partners. However, all reports can be exported to a spreadsheet for further sorting. Another handy feature is that you can enter a keyword search and SEMrush will list related phrases and the Adwords cost of those keyword. Again, this helps you to put a value on your webpages and also can provide insights into other keywords that you have not considered already for your campaigns. You can also look the the amount of competition for various keywords, if competition is low then this indicates that you could get some easy SEO wins on those words. It may be easier to improve rankings for 10 relative low ranking keywords phrases than 1 very popular keyword. This report provides a list of all your major competitors according to Google. This often includes many of the major Internet brands to start with, such as Amazon, About.com, Yahoo and Wikipedia, but also provides useful data on many smaller websites which are your direct competitors. It is these smaller websites which you should focus on. Look at what they are doing, what they are writing and take a look at their back link profile to get an idea of their marketing methods. This report also shows the search engine traffic price, i.e. the total ad spend these sites would need to do to get their traffic levels. When you look at these figures it very quickly becomes apparent why SEO is so important. About.com would need to spend around $36 million a year to get the traffic it gets from search. This report is excellent if you are looking to expand your advertising inventory and want to quickly source some new partners. The report shows how much each website is currently spending on advertising which can give you a good idea of how much they rely on advertising. If a website is already spending a lot of money it could be a sign that they would be open to expanding their advertising into new areas. One excellent feature here is that you can filter by country. For example, I run a site that has a global audience but I can use SEMrush to find UK advertisers to contact. These may be easier for me to contact and deal with than some international companies who operate in different time zones and do not have UK bank accounts. Overall SEMrush is certainly a useful tool. The reports are clear and the information is explained well throughout the site (hover on any ? and you will see a pop up with an explanation of the data). The reports provide a lot of information about your own site and also give a lot of ideas on how to promote it further using CPC, SEO and also how to monetize it better. Leave a comment below using the same email address that you use for your SEMRush account and I will send you your personal upgrade code. I have decided to give away the codes to our first 20 readers to leave a comment below. In the comment you can share the site that you are planning to promote if you like too. How’s that for an unbeatable offer? Promote your site here and get a month trial to a great SEO tool. (all comments are moderated prior to being published and I have the right to not publish anything that I find offensive in any way whatsoever. Don’t worry, I am pretty liberal). Thanks for the awesome post- lots of useful information. I would definately like to get my hands on a promo code as I would like to discover the full potential of this tool. Code is on its way to you Sadie. Well done sir! You displayed #6 in Google for “semrush trial account”. I’d like a code , please. Didn’t know that! I assume that is how you found this page? Code on its way. Thanks for those details above seems very useful for keyword ideas. I’d like to try it. Thank you for your kindness… It’s look like a great tool. Want to try it first. Useful information, thanks a lot. I must try this.. I read the above information, this tool is very powerful. Thank you sir. Herbert, Mirsatu – SEMRush codes on their way by email. Remember to tweet, share, like etc. Many thanks! Also – for all of you – please feel free to leave feedback on using the tool here. Other readers will enjoy seeing your reviews. The code has been mailed to you, use it or lose it! Is it still available :).. Codes going out now, check your emails and activate your codes – let the search marketing commence! Remember, please activate your codes, they do expire at the end of the year and many free SEMRush codes have been sent out and not activated yet. Hey is that code still available? Sure is Becki, code on its way over. Hi there: thanks for the offer. I would be interested in trying the SEMrush one-month trial. Do you have a code for me? Thanks very much. Hi James, sorry, but I think this offer is close now. At least, we have not done anything with it for a long time.